ReadyFundGo is a powerful tool created to harness a community passionate about your ideas or project. ReadyFundGo is an online ‘crowdfunding’ platform helping people raise funds to bring their ideas to life, fund a start-up business, grow an existing business or just generally raise money for a project or cause. Our community consists of imaginative, inventive and ambitious campaign creators with exciting campaigns that need the support of people like you to help bring them to life. ReadyFundGo is owned by My Crowd Pty Ltd (MC). MC was launched in Sydney 2013, Australia and the RFG team is located in Sydney, NSW. Our goal is to help people raise capital to fund growth of existing startups, entrepreneurial ideas, social enterprise and environmental campaigns. Crowdfunding is becoming an ever popular way of raising funds outside of traditional avenues such as banks, finance companies and yards of scary red tape. It is an easy and innovative way for people and organisations to raise money to get their campaign or new business funded. $5.1 billion USD was raised for ideas, projects and businesses through crowdfunding in 2013. The industry has doubled every year for the last three years, helping hundreds of thousands of people get an idea off the ground. We think it’s a fantastic way to help your ideas take off! Simply start creating your campaign (for free) by first selecting a category and title (which you can change at any time before submitting it) and registering online. Next, decide on a clear funding goal, the rewards you’ll offer, an end date (we recommend 6-9 weeks) and a story of what the funds are needed for along with videos, photos and images. Once you’ve entered these details, as well as other basic info, simply submit your campaign to us for approval. Once its approved, your fans and supporters can start supporting your campaign by pledging for the rewards you offer. There are two different types of campaigns: ‘All Or Nothing’ or ‘Take What You Can Get (Flexible)’. ‘All Or Nothing’ campaigns are a type of campaign where the creator has decided on a final goal amount in a set time frame. If that goal is not met within that time frame no funds are taken from the backers. Their cards are simply preauthorised, not charged. With ‘Take What You Can Get (Flexible)’ campaigns, the campaign creator received whatever funds are raised, regardless if it hits its goal or not. Who can set up a campaign on ReadyFundGo? Anyone with a great idea and clear funding goal, over the age of 18. (See Terms & Conditions for those under 18 years old). Who can support campaigns on ReadyFundGo? Anyone can support campaigns on ReadyFundGo provided they have sufficient funds on their bank or credit card. What’s in it for campaign supporters? Supporters can receive a wide variety of rewards for their contribution when they support a campaign. Some will be physical rewards and some will just be ‘feel good’ donation based rewards depending on the nature of the campaign. It is free to set-up a crowdfunding campaign with ReadyFundGo. ReadyFundGo receives a 5% service fee from money raised by ‘All or Nothing’ campaigns that have reached their target goal. If the campaign does not reach its goal, no fee is charged. For ‘Take What You Can Get (Flexible)’ campaigns ReadyFundGo receives a 5% service fee of the funds raised. For crowdfunding campaigns located in Australia, Stripe also charges a minimal credit card processing fee. Their fee is 1.75% +30c per transaction for domestic cards and 2.9% + 30c per transaction for international cards. What currencies does ReadyFundGo support? Australia, Canada, Denmark, Findland, France, Ireland, Japan, Norway, Singapore, Spain, Sweden, USA, UK. If you forgot your password simply click ‘Forgot my password’ and follow the prompts on the ‘login’ screen. An email will be sent to you asking you to enter a new password. Can I log in with Facebook? Absolutely! When you first register you will be given the choice of registering with an email address or Facebook. We recommend that you connect with Facebook as it’s the number one interactive social media platform for crowdfunding and makes it easier to share your campaign. Is a campaign creator legally obligated to fulfil the promises of their campaign? In one word YES. Ready Fund Go’s Terms and Conditions require all campaign creators to provide campaign supporters the rewards they have purchased once the campaign finishes. If they are unable to fulfill their obligations, the campaign creators are required to refund the contribution received for any reward they do not or cannot fulfill. If a campaign creator doesn’t fulfill their promise there may be legal ramifications. Does ReadyFundGo refund contributions if a campaign doesn’t go ahead? For campaigns that are ‘All or Nothing’ ReadyFundGo takes an authorization of the campaign supporter’s credit card at the time they commit to supporting the campaign. If the campaign does not go ahead we will not process the payment. For campaigns that are ‘Take What You Can Get’ ReadyFundGo will not issue any refunds. For these types of campaigns the creator has agreed that they will provide purchased rewards to supporters even if they don’t reach their goal. We advise supporters to carefully consider the credibility of a campaign before deciding to support it. Who can support a ReadyFundGo campaign? ReadyFundGo is a global funding platform. Anyone can support a campaign to meet its funding goal. What are the benefits of supporting a campaign? You may have the opportunity to be the first to purchase a product before general release. You can buy a new product at a special price before general release. You can support a personal campaign for friends, family or community with ease. You can donate easily to charities and local communities that you believe in and want to support. How do I know that the campaign creator is who they say they are? All of our campaign creators are required to submit secure ID verification when linking their bank accounts, adding essential security to our campaigns for your assurance! You can also view the creator’s profile from the campaign page, by clicking on their name. This will take you to their profile page. Often times, creators will have also connected their website, LinkedIn account or other social media links to share a bit more about themselves. If you still have questions, feel free to post a questions you have on the ‘comments’ section of their campaign page. How do I find out more about the campaign I want to support? Ask the creator! Visit the ‘comments’ area of their campaign page to ask them a question directly.The creator will be notified by email when you do. You can also view their project on any website or social media links they provide on their campaign page. No. The amount of your contribution and the reward selected are never publicly displayed — only the campaign’s creator will be able to see that information. The rewards are all listed on the campaign creator’s page for you to purchase. Will I be able to find out who else is supporting the campaign? Supporters of the campaign can choose to pledge ‘anonymously’, or to have their first name or full name displayed. The list of supporters can be viewed on the ‘supporters’ tab of the campaign page. Can I contribute more money than the rewards listed? Yes you can. Click on the ‘Support Now’ button, choose the drop down reward you wish to purchase and change the total to whatever you wish to donate. This total must be higher than the original reward. You can simply pledge by using your bank or credit card. Payment is made by the securest payment methods offered on the ReadyFundGo site for your own protection. You cannot pay by cheque, cash or by direct deposit. Currently we offer Stripe and can accept payments in multiple currencies. See currencies on website for full list. 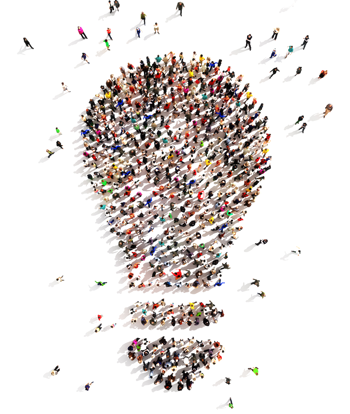 When you contribute you are committing to supporting a person’s idea or project. It will usually not be possible to cancel a commitment once it has been made. What happens if the campaign doesn’t go ahead? If an All or Nothing campaign does not go ahead you will not be charged for any contributions made or rewards purchased. Under a Flexible campaign the the Campaign Creator is responsible for delivering the rewards purchased or where this is not possible providing an alternative reward. Do I get updates on the campaign after 100% funds goal is achieved? Yes you will be notified automatically as soon as the campaign is finished. The campaign creator will be in touch with you to let you know when you can expect to receive your reward. Who is responsible for fulfilling the promises of the campaign? Ready Fund Go is not involved in the development of campaigns. It is the responsibility of the campaign creator to fulfil the promises of their campaign. Ready Fund Go reviews campaigns to ensure they do not violate our Terms and Conditions, however we do not investigate a campaign creator’s ability to complete their campaign. Instead, we encourage creators to share links to any websites that show work related to their campaign, or past campaigns. It’s up to them to make the case for their campaign and their ability to complete it. The web is an excellent resource for learning about someone’s prior experience. If someone has no demonstrable prior history of doing something like their campaign, or is unwilling to share information, supporters should consider that when weighing up their decision to make a contribution. If something sounds too good to be true, it very well may be. Ultimately, you (the supporter) decide if a campaign is worthy of your support. In some countries, donations made to a legally registered non-profit or charity may be considered eligible for donors to claim as a tax deduction. Again, every situation is different so please consult with a tax professional in your location. How do I set up a campaign on ReadyFundGo? What sort of Rewards should I offer? Your rewards should be as creative as you can make them and always try to offer something a little different or individual to your supporters. Remember supporters have different budgets so make sure that you offer rewards to suit everyone. Statistics have shown that campaigns with a total of 9 rewards are the most successful. Remember to factor in any shipping costs to the final price. What is the campaign goal and deadline? The campaign goal is the amount of money that you need to make your campaign a success. All ReadyFundGo campaigns have a deadline in which to reach your goal. This date is set by you. Research shows that campaigns that run for a 29 to 41 day period are the most successful, regardless of the amount that needs to be raised. Can I leave the deadline open? No – because you need to pay out your rewards at the end of your campaign. If you have no end, you will never pay your rewards or be able to claim your campaign contributions. Can I extend my deadline if I don’t reach my funding goal? No as this may upset or frustrate supporters who have already purchased rewards and are expecting delivery of them within a certain time frame. If you are thinking of extending your deadline, create a second campaign. Can I edit my campaign once it has launched? Yes you can, just go to ‘Manage Campaigns’ in My Account and edit your campaign there. Campaign updates are when you update information about the progress of your campaign throughout the life of the campaign. Campaign updates get delivered to all supporters at the same time. Updates can be made by logging into your account and going to the ‘Updates’ tab on the campaign creation form. It will automatically email all of the people that have pledged to your campaign when you submit the update. What happens when my campaign reaches 100% of its funding goal before the campaign’s deadline? Your campaign will continue to run until your campaign deadline. This applies even if you have reached your funding goal. What happens if I exceed my funding goal? All funds are yours, minus our standard fee for hosting your campaign together with minimal debit/credit cards fees charged by Stripe. If your campaign is an ‘All or Nothing’ campaign you will not receive any funds and no service fee is charged by ReadyFundGo. For Flexible (‘Take What You Can Get’) campaigns “Net Funds” are transferred to you by Stripe during the course of your campaign as pledges are made, regardless of whether you meet your funding goal or not. What happens when the campaign reaches its deadline? If your campaign is an ‘All or Nothing’ campaign and you haven’t reached your goal, no funds are collected or payable and Ready Fund Go will not charge any fees. Your campaign will no longer be live. For successful ‘All or Nothing’ campaigns, funds are collected as soon as the campaign has finished. These funds (less service and transaction fees) will be transferred directly to your nominated bank account by Stripe after the campaign deadline. You are responsible for completing the campaign and delivering the rewards promised to your supporters. For Flexible (‘Take What You Can Get’) campaigns “Net Funds” will have been transferred to you by Stripe during the course of your campaign as pledges were made. You are responsible for completing the campaign and delivering the rewards promised to your supporters. How do I contact and distribute the rewards to my supporters? We’ve made it easy by creating a pledge report area in your campaign dashboard. Simply go to the ‘pledges’ link while viewing your campaign dashboard. There you can view pledges in real time, get pledgee contact info, and export a .csv file. This pledge report can be accessed at anytime once the campaign is published. How long does it take ReadyFundGo to transfer funds to my account? For Flexible (‘Take What You Can Get’) campaigns that raise funds, you do not need to wait until the Campaign Deadline to receive your funds. “Net Funds” are transferred to you by Stripe during the course of your campaign as pledges are made. For All or Nothing campaigns that raise funds, you will receive the “Net Funds” from Stripe after the completion of your Campaign when your target has been met. Can I access contributed funds before I reach my funding goal? Can I share my campaign on social media sites? Yes, of course, you must give your campaign the best chance of success and Social Media is where it’s at. It’s up to the campaign creator to promote and gain support. Facebook, Twitter, Instagram, LinkedIn are a few examples of social media platforms that can help boost your campaign. Your campaign page will include easy-to-share social media links at the top. When the public shares your campaign using these links (as well as after they checkout when pledging), you can track shares and reward those that share the most! Your campaign page will include easy-to-share social media links at the top. When the public shares your campaign, you can track shares and reward those that share the most! Can I run more than one crowdfunding campaign? You can but we recommend that you don’t because you will exhaust your support networks and bombard people with too much information at the same time. You will learn a lot from your first crowdfunding campaign and get maximum support from your supporters by running one campaign at a time. Best advice is to wait until you can apply what you’ve learned from each campaign to the next one. What should I do if I am having problems completing my campaign? It’s not uncommon for things to take longer than expected. If problems or issues occur, creators should post a campaign update in their campaign feed. This will be emailed to all campaign supporters as an update. Creators who are honest and transparent will usually find that supporters are understanding and actually respect you more. It’s all part of the journey. Sometimes the execution of a campaign can prove more difficult than the creator had anticipated. If the problems are severe enough that the creator can’t fulfill their campaign, creators need to find a resolution. Steps could include offering refunds, detailing exactly how funds were used, and other actions to satisfy campaign funders. Do I have to pay tax on funds raised? As everyone’s situation is different, we are unable to provide specific tax advice, so we suggest you check with the tax authority in your country of residence. If you are located in Australia, visit the Australian Taxation Office or take professional advice. I’ve heard that 30 days is the best campaign length. Do higher goals need longer to succeed? Turns out, absolutely not. 29 to 41 days is the sweet spot for all projects, regardless of the size of the goal. Do projects with higher goals get larger pledges? Yes, the contrast principle is alive and well. It does appear that, statistically speaking, projects with higher goals tend to get higher average pledges as well. Do projects with more expensive products/outcomes get larger pledges? Yes, even more so than above. The project categories that get the highest average pledges are Technology, Design and Film & Video in that order. The categories that get the lowest average pledges are Comics, Publishing and Games. In fact, even within those categories, the subcategories that imply physical products, thus requiring materials, time per duplicate and shipping, are also those that get the highest average pledges. For example, in the Technology category, Hardware gets much higher pledges on average than does Open Software. In Art, the subcategory with the lowest average pledges is Digital Art, while the highest average pledges in the Art category are in Painting and Sculpture. Note that this does not imply a causal relationship: Categorizing your project incorrectly is not likely to bring you more pledges. It can, however, provide reassurance to creators whose ambitions involve more expenses. 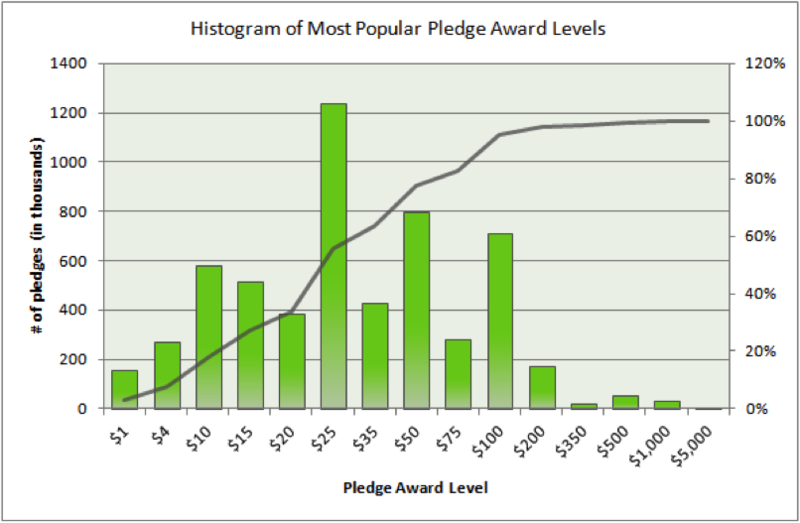 What are the most popular pledge award levels? Without a doubt, the $25 pledge range is the most popular, most selected award level. This is driven by the multitude of projects that will result in a CD or DVD, where $25 is a reasonable pledge to get such a reward. $50, $100 and $10 pledge ranges are the next most popular, in that order. How many reward levels should I have? The average number of reward levels is 9 for successful projects, and 7.5 for failed projects. Also, the average pledge level for successful projects was $350, while the average pledge level for failed projects is $460. How much money should I go for? Most Kickstarter campaigns have goals set at $7,500 or less, with a large number at less than $3,000 goals. The success rate of the projects with these goals is much higher than more ambitious goals. Failed campaigns tend to have much higher goals; many creators have admitted they were too greedy on their first tries. The good news is that it costs you nothing to try, save for your time and energy. So set your goal at the minimum to cover your costs to finish the project, and if it doesn’t make it, then you haven’t lost any money on the deal.